22 Dec Strong finish to a momentous year. 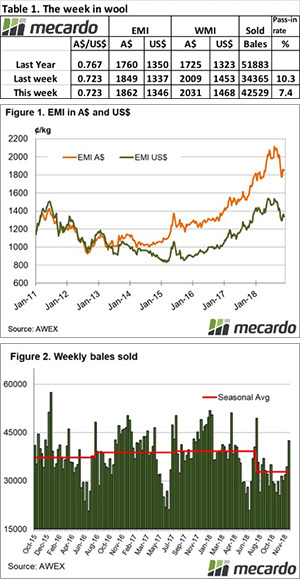 Exporters would be pleased with the final selling week; a solid finish before the break provides opportunity to write new orders for the re-start in 2019. 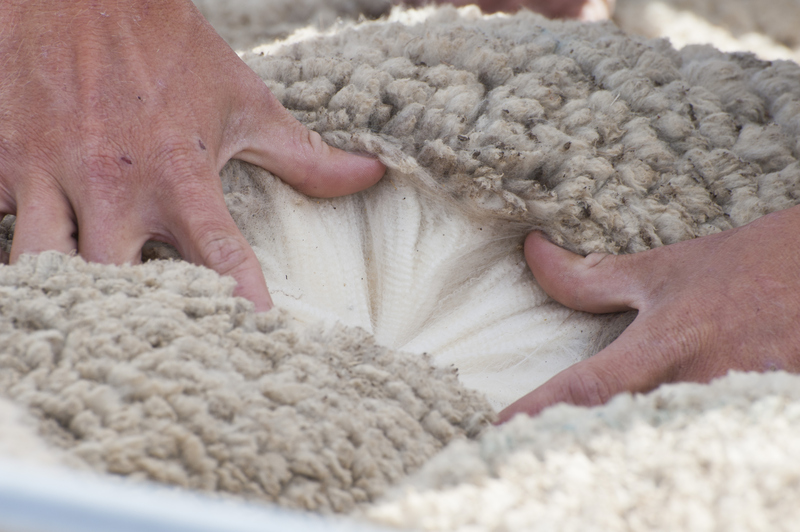 The market rose on each of the selling days, providing a sense of stability to an otherwise volatile ride for the wool market in 2018. The Eastern Market Indicator (EMI) rose, ending the week at 1,862 cents. The Au$ was slightly stronger, closing at 0.723 US cents. That put the EMI in US$ terms at 1,346 cents, a gain of 10 cents (Table 1). In the west, the Western Market Indicator (WMI) also rose over the week to end at 2031 cents. Compared to the original roster posted last week, 46,003 of the 48,700 bales intended for sale this week came to the market. The stronger market meant growers only passed in 7.6% of bales offered. This resulted in a clearance to the trade for the week of 42,529 bales (Figure 2). In the auction weeks since the winter recess, 618,752 bales have been cleared to the trade. For the period up to the Christmas break, on average almost 9,500 per week or 181,400 fewer bales have been cleared to the trade compared to the same period last year. The dollar value for the week was $83.88 million, for a combined value of $1.56 billion so far this season. The large crossbred offering again resulted in a mixed result, with early sales for the weak softer before improving by the end of the week. The oddments market again fell between 30 and 50 cents with Fremantle most affected. This is the last sale for 2018, with a three-week recess. The strong finish in the auction to 2018 bodes well for next year, although there are mutterings from exporters that buying orders are spasmodic and on a “just – in – time” basis. Of note is that the forward market activity is pointing to a solid start to 2019 also.